On 14 September 2013, His Beatitude Patriarch Theophilos III of the Holy City of Jerusalem and all Palestine met with hegumen Feofan (Lukianov), acting head of the Russian Ecclesiastical Mission in Jerusalem. The participants in the meeting discussed the installation of seven bells granted by His Holiness Patriarch Kirill of Moscow and All Russia to the Patriarchate of Jerusalem. The bells are planned to be installed at the belfry of the Church of the Holy Sepulchre. At present the belfry of the Church of the Holy Sepulchre has eighteen bells. Notable among them are the Russian bells which have especially melodious carillon. The largest bell in this set weighs five thousand nine hundred kilograms. It is the biggest bell in the Holy Land made in 1886 at A.D. Samgin’s Moscow Bell Casting Factory, on money donated by God’s servant Feodor, as inscribed on the bell. Regrettably, some of the bells have lost their sound with the lapse of time and need to be replaced. 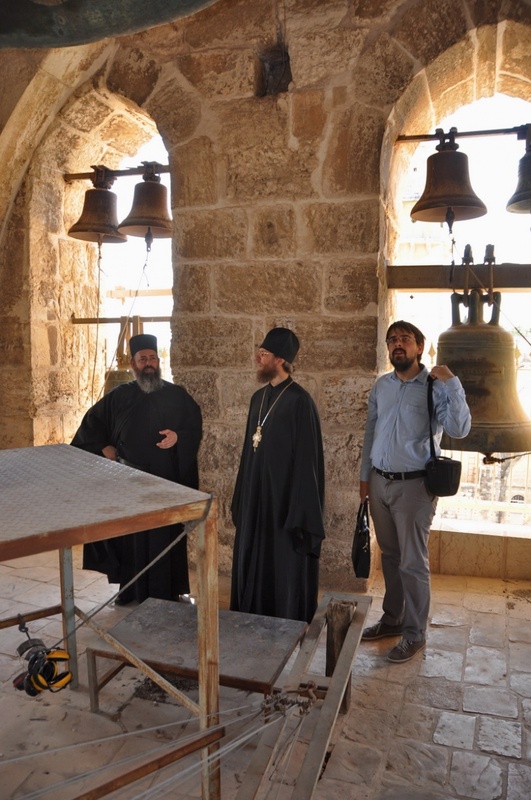 A set of small and medium bells granted by the Primate of the Russian Orthodox Church to the Patriarchate of Jerusalem will supplement the existing bells’ carillon and enrich their sound palette.